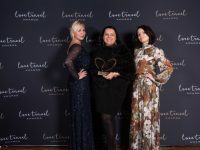 Maldives Promotion House – Four years after they first met, Helen and Joe Maughan flew out to Constance Moofushi in the Maldives for their dream island wedding. 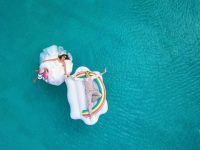 Helen and Joe chose Moofushi because they wanted a romantic wedding in paradise… barefoot with nothing to worry about except enjoying their big day. After a civil service ceremony in London, Helen and Joe arrived at Moofushi four days before their wedding, which took place on 2 February 2011. After going through the details, Helen and Joe could relax for a few days before their wedding. 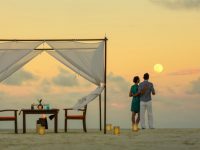 On the day of the wedding, Helen and Joe indulged at Moofushi’s beautiful over-the-sea spa with a couple’s massage and facial before heading back to their room to share a bottle of champagne. ‘Joe was then picked up by a golf buggy and taken to one of the water villas to get ready. Corinne brought my flowers round and took the wedding bands. I was met at 4pm by the wedding band and walked to the jetty where I met my husband-to-be! We were then taken to the sandbank on a golf buggy decorated with flowers where the ceremony was then held. After the ceremony, the couple enjoyed more champagne and wedding cake before having photos taken at different locations on the sandbank and across the island and, in keeping with tradition on Moofushi, planting a coconut tree. As the sun went down, Helen and Joe shared cocktails and had a romantic dinner of lobster and steak on the beach for just the two of them. ‘We would definitely recommend Moofushi – everything went perfectly and we didn’t have to worry about a thing. 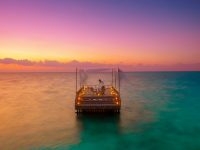 To the groom – don’t worry about bringing any shoes or a tie for your wedding as the beauty of getting married in Maldives it is so laid back’ commented the happy couple.